With over 12 hours of presentations from some of the cycling world's foremost authorities, this comprehensive video series is an indispensable resource no matter the level of athlete or the discipline that you coach. Learn cutting-edge philosophies on technical skills, nutrition, strength training, BMX cycling, revenue generating and much, much more. Not a coach? No problem. What you'll learn from this series will positively impact every facet of your training and translate to huge performance gains. Racing, Training, Coaching and Parenthhod: How to Train an Athlete Living a Life of Organized Chaos. Recorded Live at the 2012 USA Cycling Coaching Summit. Sean Madsen from Specialized Bicycles discusses the BodyGeometry Fit program and the importance of ergonomics in design. A presentation by Neal Henderson entitled - Coaching the Athlete from the Ground Up. 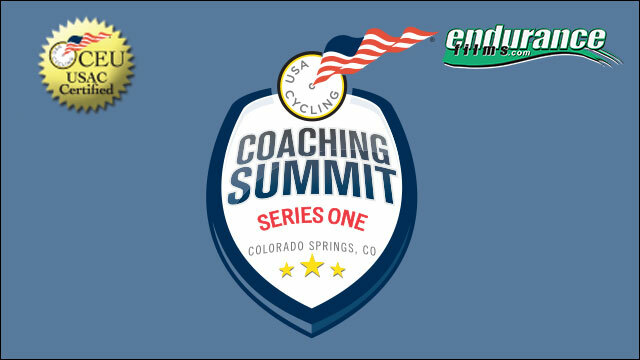 Recorded Live at the 2012 USA Cycling Coaching Summit. Topics include: Henderson's background and athletes coached, High performance coaching for every level athlete, Team approach, Your high performance team and specialists involved, Initial set up: Fit and Fitness, Case study, High tech bike fit tools, Fit as a process, Physiology testing, Lab testing, Physiology testing case study, Field testing, Lab vs. field testing, Objective/Progressive training, Objective performance tracking, Training progression, Competition plan/summary, Integrating power and video, Teachable moments. A presentation by USAC VP of Athletics, Jim Miller entitled - USA Cycling Athletic Pathways. Recorded Live at the 2012 USA Cycling Coaching Summit. Topics include: Miller's background with USAC, Fueling international success, USAC's vision, Looking at international facilities, Men's Endurance Program, Women's Endurance Program, BMX program, Mountain Bike program, Track program, Sprint Track program, Sustained success. A presentation by Erik Seedhouse, Ph.D entitled - The Art of Aging Gracefully. Recorded Live at the 2012 USA Cycling Coaching Summit. Topics include: Pushing the boundaries, Becoming a Master's athlete: Aging's effects on MHR, Muscle, Recovery, VO2 max, Lactate Threshold, Exercise Economy, Looking at research, The good news!, The Coaches Toolbox.